According to a study by the British linguist David Graddol, regarding the position of English as a global language, "complex international, economic, technological and cultural changes could start to diminish the leading position of English as the language of the world market". With the numbers of Mandarin and Spanish speakers overtaking English speakers, it is not hard to visualize such a scenario in the future. The writing on the wall clearly highlights the importance of breaking language barriers and reaching out to the global customers in a language they are familiar with. With the expansion of global marketing and economy, Internet is increasingly being used to run businesses all over the world. As more non-English speakers are using Internet, it makes better business sense to provide content in the local language of Internet users. That's the reason why we say that language is the key to global markets, and stresses on the reason why language translation services are in great demand. By translating your website, documents, advertisements and other relevant information into Mandarin, Spanish, French, or Arabic, etc, your organization will be able to market your products and services globally. On the other hand, you might not be native English business owner who wants to provide his/her services to the global market. In that case it becomes essential for you to have your content well-written in English, the most widely acknowledged language, so as to reach majority of the customers. Accuracy is the key while getting your message across to global customers. Machine translations just won't get it right. A single mistake in translation can completely change the meaning and intent of your message, and reduce its significance. Therefore, it is important to have your content translated by experts. However, just having accurate translation is not enough, cultural adaptations are equally important. A Chinese website translated from an American website, needs to be presented with local Chinese elements, without cultural references to the original US website which might be irrelevant or offensive to the Chinese audience. This is called localization, and is vital to the success of translation into a local language. Therefore, while opting for language translation services, it is crucial to partner with a provider, which ensures accurate and localized translations by native language speakers so as not to offend local sensibilities and cultural values. If you are looking for high-quality language translation services, look no further. We at O2I have been providing accurate and cost-effective translation and localization services to our customers across the globe for over 20 years. We can flawlessly translate your documents into any global language within short turnaround times. 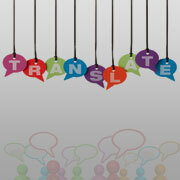 Contact us to outsource your language translation services.